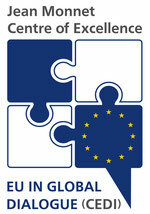 Jean Monnet Award for EU in Global Dialogue - eu-global-dialogues Webseite! 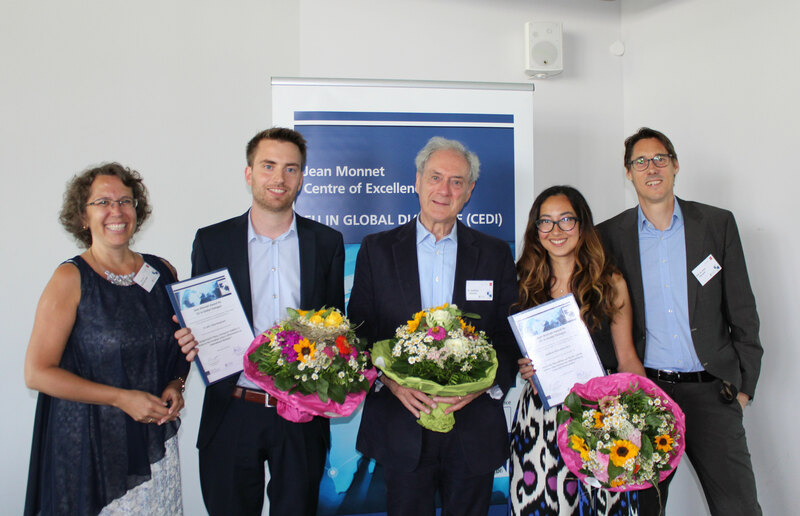 The Jean Monnet Award for EU in Global Dialogue honours excellent BA, MA and PhD theses and encourages to continue their work and pursue subsequent research questions. At the same time, the award increases the visibility of EU studies within the participating universities and provides incentives for students to work on topics related to EU studies. Students who completed their Bachelor, Master or doctoral thesis in the field of EU studies and EU’s role in the world at the universities of Darmstadt or Mainz are eligible to receive the award. A jury, comprising of the Jean Monnet Chair holders Prof. Michèle Knodt (Darmstadt) and Prof. Arne Niemann (Mainz), one senior researcher, and one doctoral student, will evaluate the completed Bachelor, Master and doctoral theses in the field of EU studies that have a focus on the EU in global dialogue. The award ceremony will take place during the annual lecture. On June 26, 2018, CEDI awarded two prizes to outstanding theses on EU in Global Dialogue at TU Darmstadt. 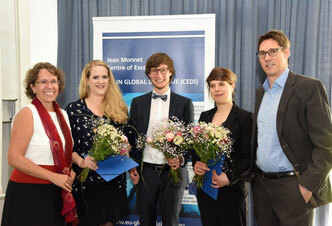 A jury selected the Bachelor thesis of Julia Blöser (JGU Mainz) and the doctoral thesis of Simon Bauer (TU Darmstadt). The award ceremony took place during CEDIs Annual lecture 2018. Julia Blöser received the CEDI Award 2018 for her outstandind thesis on "Rationales of Action in the European Union’s Asylum Policy: An Empirical Investigation of Relocation Commitment Between Interests and Norms". Simon Bauer was awarded for his doctoral thesis on "How European Citizens Have Turned Against their Union – The EU Squeezed between Citizen Preferences in Donor and Crisis Countries. An Empirical Analysis of Political Attitudes and Electoral Behaviour During the Euro Crisis". 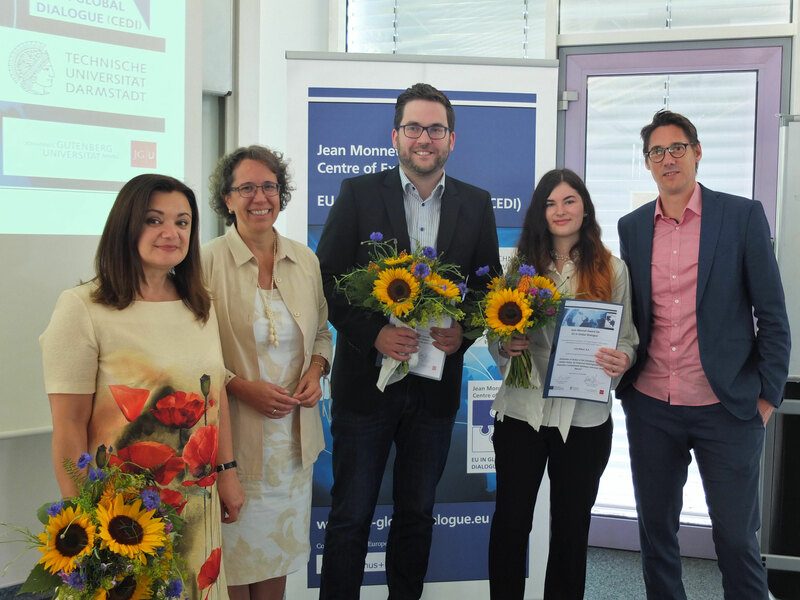 On June 23, 2017, CEDI awarded two prizes to outstanding theses on EU in Global Dialogue at JGU Mainz. A jury selected the theses of Asalkhon Shukurova (M.A., TU Darmstadt) and Dr. Julian Bergmann (JGU Mainz). The award ceremony took place during CEDIs Annual lecture 2017. Asalkhon Shukurova received the Award for her outstandind thesis on the analysis of the perception of the EU and Ukraine in Russian media. Julian Bergmann was awarded for his doctoral thesis on "Bargaining for Peace, Striving for Stability. A Study on the European Union’s Effectiveness as International Mediator". On July 1, 2016, CEDI awarded three prizes to outstanding theses on EU in Global Dialogue at TU Darmstadt. A jury selected the theses of Simon Ant (M.A., JGU Mainz), Katharina Kleinschnitger (M.A., TU Darmstadt) and Dr. Stephanie Bergbauer (JGU Mainz). The award ceremony took place during CEDIs Annual lecture 2016. Simon Ant received the Award for his thesis on EU conditionality and democratization in the Republic of Moldova. Katharina Kleinschnitger explored the relations between the EU and countries of the Eastern partnership in her prize-winning masters thesis. Dr. Stephanie Bergbauer was awarded for her doctoral thesis on "European Identity in Testing Times – Levels and Determinants of Citizens‘ Identification with Europe from the Treaty of Maastricht to Eastward Enlargement and the Eurocrisis".